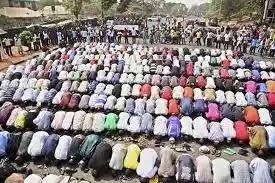 In an effort to promote religious tolerance, better understanding and peaceful coexistence between Christians and Muslims in Nigeria, a group of Christian clerics have donated plastic kettles and prayer mats to some mosques in Kaduna metropolis. The items, which are to be used for prayers, is a mean of strengthening peaceful co-existence and religion tolerance in the country. Leading the clerics, Pastor Yohanna Buru, the General Overseer of Christ Evangelical Intercessory Fellowship Ministry, Sabon Tasha, Kaduna, accompanied by Reverend Fathers, Evangelists and church members, met with Islamic scholars with the sole aim of making their followers learn to live with one another in peace, irrespective of religious differences. Pastor Yohanna Buru said, “We have come to donate these plastic kettles and prayers mats to the mosque leaders, because we all worship one God and we are from one family- Adam and Eve; so, we should be teaching both Muslims and Christians how to forgive, tolerate, love, accommodate each other and to preach against attacking holy places. “The division in Kaduna State is as a result of religious and political crises that has caused a major setback to peace and stabilty in the state. Receiving the gift items at the mosques at Tudun Wada, Kaduna, Sheikh Abdullahi salihu Maibarita, a Muslim scholar, expressed satisfaction and called for peace and harmony among Nigerians. He added that it was a surprise to Muslims Umma for Christians to buy praying items for them. Sheikh Maibarita said this was the first time in the history of Nigeria Christian leaders were buying something for Mosques.